Oyster Divers in Mazatlán/Los Ostioneros | ¡VidaMaz! Today we had breakfast with Victor. 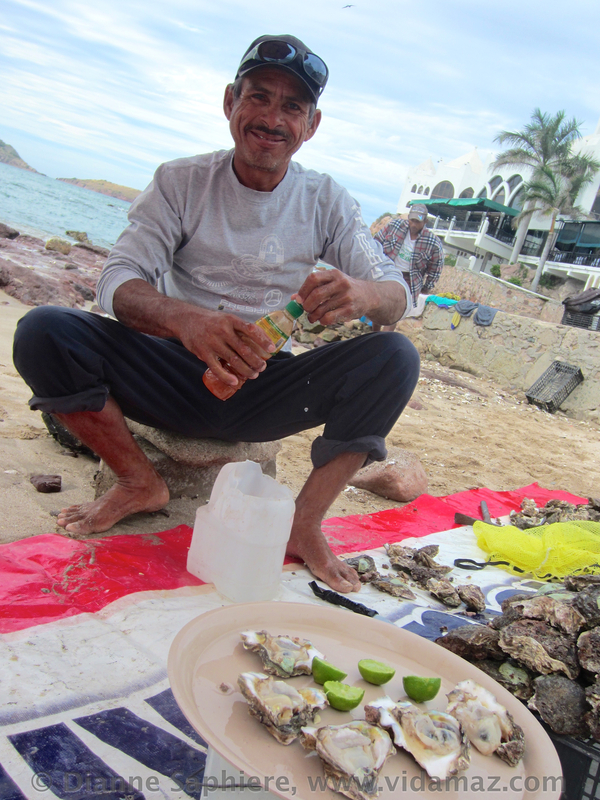 He is an oyster diver here in Mazatlán, and has been for 33 years. His brother, Javier, has been diving for oysters for 28 years. Their father before them was an oyster diver for 52 years. There were 12 divers late this morning on Playa Camarón, just off Valentino’s/Fiesta Land, and they were all family: brothers, uncles, nephews, cousins. Victor told us there are at least ten locations or oyster reefs around town that are good for diving. He told us they start work about 8 or 8:30 each day, diving till 10:30 or 11. Each diver makes what he makes; they are not a cooperative. A normal haul — one fill of the net in one of their inner tubes — is about 50 kg. They pack the oysters into green mesh bags that weigh about 23 kg each. Those bags wholesale for about 400 pesos locally. For our breakfast we were charged 30 pesos (about US$2) for five oysters shucked fresh from the water as we watched. Fresh limes and bottled salsa were available, as well as plastic stools on which to sit while we ate. Victor explained to us that they throw the shucked oyster shells back into the ocean in order to increase the harvest: that the shells have larvae on them, and they will replant and grow. He also told us about how they have a forced holiday every summer, when the veda is in place — when it’s illegal to dive for oysters. That’s why September is so often called “Septi-hambre,” the hungry month, because it comes after they’ve had three months of no oyster income. I asked Victor how long he stays under water when he dives. He said if the water is about three meters deep, they stay down about 40 seconds, hammering on the rock to get the oysters loose. If it’s deeper water, they may stay down as few as 20 seconds at a time. Based on my observations, I’d say he underestimates. He told us that sometimes tourists like to come out diving with them. They bring underwater cameras, and ask the guys to teach them how to oyster. He thinks it’s cool that they want to take home with them such a souvenir: a new skill, a new experience. Below is a slideshow with a few more photos. ¡Gracias, Victor y familia! And you, Chuy, are one of the people who make Mazatlán so INCREDIBLE! Gracias a tí! Very glad to hear it’s spreading a bit of warmth and sunshine northward, Kathi! Thanks for sharing and big hugs your way! How very kind of you, Penny. I so appreciate your taking the time to let me know! We truly are blessed with incredible people, natural beauty and resources here in Mazatlán. It is my privilege to be able to post a bit about it in my free time.